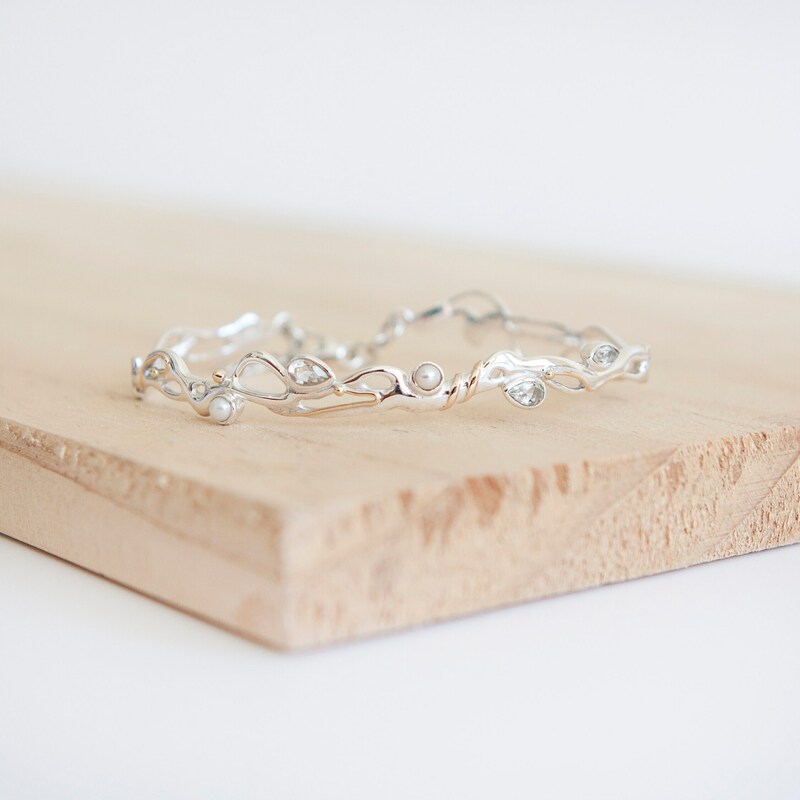 A hinged silver bracelet adorned with flowing gold filled wire and set with freshwater pearls and green amethyst. This lovely piece includes a sterling silver disc that includes up to 40 characters of engraving over two sides worth £56. It is a fantastic way to add a personal touch to a very beautiful piece of jewellery. What's more - because of the unique way that we attach your disc, it can be removed and used as a standalone charm on a charm bracelet and, best of all, it is possible to personalise this charm further - including options such as adding one of our fabulous symbols, changing the finish of your disc to rose/yellow gold, changing the chain or even adding a single birthstone to stand alongside your engraving at a small extra cost. All you need to do to add a symbol or a birthstone or to change the finish or chain is just add your preferred upgrades shown at the bottom of this listing to your cart with your item. Full information about the birthstones and symbols available can be found on their respective upgrade links. Just leave the engraving that you'd like at the checkout and choose any add on that you would like to add from the links above - it's that easy! Please remember that spaces are classed as characters for space reasons so please count carefully. We engrave our pieces to create bespoke items especially for you. Although we are always happy to try and help if something is unsuitable, we regret we are unable to offer refunds on personalised items or sets. We include a Matchbox Style box as shown in the pictures above. All orders containing a luxury gift box will be wrapped for no extra charge. ⭐ We conform to all UK regulations in respect to Hallmarking with the Assay office. This means that we hallmark all of our items. The only exceptions are items which fall beneath the specified weight thresholds which are 1 gram for gold, 7.78 grams for silver, 0.5 grams for platinum and 1 gram for palladium. We are happy to hallmark any items below this weight, but there will be an extra charge of £20 for doing so as this will not have been factored into our pricing for that item as it isn't required as standard. We want you to be fully informed about your rights, and how Songs of Ink and Steel uses your data; for example, we will explain things such as how we combine data to build a picture of you. It’s likely that we’ll need to update this Privacy Notice from time to time. We will notify you of any significant changes, but you are welcome to come back and check it whenever you wish. In certain circumstances, we need your personal data to comply with our contractual obligations.For example, if you order an item from us for delivery, we’ll collect your address details to deliver your purchase, and pass them to our courier. If the law requires us to, we may need to collect and process your data. For example, we can pass on details of people involved in fraud or other criminal activity affecting Songs of Ink and Steel. In specific situations, we require your data to pursue our legitimate interests in a way which might reasonably be expected as part of running our business and which does not materially impact your rights, freedom or interests. For example, we will use your purchase history to send you or make available personalised offers.We also combine the ordering history of many customers to identify trends and ensure we can keep up with demand, or develop new products. We will also use your address details to send you marketing information by post, telling you about products that we think might interest you. When you visit any of our websites, and use your account to buy products on the phone, by fax in person or online. When you purchase a product in person or by phone but don’t have an account. When you ask our team to email you information about a product. When you comment on or review our products and services. Any individual may access personal data related to them, including opinions. So if your comment or review includes information about a member of staff who provided that service, it may be passed on to them if requested. When you fill in any forms we may collect your personal data. We collect data from publicly-available sources (such as Companies House) when you have given your consent to share information or where the information is made public as a matter of law. If you have a web account with us: your name, gender, date of birth, billing/delivery address, orders, receipts and payment details, email and telephone number. For your security, we’ll also keep a record of your login password. Details of your interactions with us by telephone, email and online.For example, we collect notes from our conversations with you, details of any complaints or comments you make, details of purchases you made, items viewed or added to your basket, brands you show interest in, web pages you visit and how and when you contact us. Copies of documents you provide to prove your age or identity where the law requires this (including your passport and driver's licence). This will include details of your full name, address, date of birth and facial image. If you provide a passport, the data will also include your place of birth, gender and nationality. We want to give you the best possible customer experience. One way to achieve that is to get the richest picture we can of who you are by combining the data we have about you. We then use this to offer you promotions, products and services that are most likely to interest you. The data privacy law allows this as part of our legitimate interest in understanding our customers and providing the highest levels of service. Remember, if you choose not to share your personal data with us, or refuse certain contact permissions, we might not be able to provide some services you’ve asked for. For example, if you’ve asked us to let you know when an item comes back into stock, we can’t do that if you’ve withdrawn your general consent to hear from us. collect your personal data during checkout, we won’t be able to process your order and comply with our legal obligations. For example, your details may need to be passed to a third party to supply or deliver the product or service that you ordered, and we may keep your details for a reasonable period afterwards in order to fulfil any contractual obligations such as refunds, guarantees and so on. To protect our business and your account from fraud and other illegal activities. This includes using your personal data to maintain, update and safeguard your account. We’ll also monitor your browsing activity with us to quickly identify and resolve any problems and protect the integrity of our websites. We’ll do all of this as part of our legitimate interest.For example, by checking your password when you login and using automated monitoring of IP addresses to identify possible fraudulent log-ins from unexpected locations. If we discover any criminal activity or alleged criminal activity through our use of fraud monitoring and suspicious transaction monitoring, we will process this data for the purposes of preventing or detecting unlawful acts. We aim is to protect the individuals we interact with from criminal activities. With your consent, we will use your personal data, preferences and details of your transactions to keep you informed by email, web, text and telephone about relevant products and services including tailored special offers, discounts, promotions, events and so on. Of course, you are free to opt out of hearing from us by any of these channels at any time. To send you relevant, personalised communications by post in relation to updates, offers, services and products. We’ll do this on the basis of our legitimate business interest. You are free to opt out of hearing from us by post at any time. To display the most interesting content to you on our websites or apps, we’ll use data we hold about your favourite brands or products and so on. We do so on the basis of your consent to receive app notifications and/or for our website to place cookies or similar technology on your device. For example, we’ll record your browser’s Session ID to help us understand more when you leave us online feedback about any problems you’re having to comply with our contractual or legal obligations to share data with law enforcement. Of course, you are free to opt out of receiving these requests from us at any time by updating your preferences in your online account. We know how much data security matters to all our customers. With this in mind we will treat your data with the utmost care and take all appropriate steps to protect it. We secure access to all transactional areas of our websites and apps using ‘https’ technology. Access to your personal data is password-protected, and sensitive data (such as payment card information) is secured by SSL encryption. for example by aggregation with other data so that it can be used in a non-identifiable way for statistical analysis and business planning. Orders - When you place an order, we’ll keep the personal data you give us for seven years so we can comply with our legal and contractual obligations. We sometimes share your personal data with trusted third parties.For example, delivery couriers, for fraud management, to handle complaints, to help us personalise our offers to you and so on. We may also be required to disclose your personal data to the police or other enforcement, regulatory or Government body, in your country of origin or elsewhere, upon a valid request to do so. These requests are assessed on a case-by-case basis. International orders - If you are based outside the UK and place an order with us, we will transfer the personal data that we collect from you to the UK. Protecting your data outside the EEA - The EEA includes all EU Member countries as well as Iceland, Liechtenstein and Norway. We may transfer personal data that we collect from you to third-party data processors in countries that are outside the EEA. For example, this might be required in order to fulfil your order, process your payment details or provide support services. If we do this, we have procedures in place to ensure your data receives the same protection as if it were being processed inside the EEA. For example, our contracts with third parties stipulate the standards they must follow at all times. If you wish for more information about these contracts, please contact our Customer Service Team. For example, when you withdraw consent, or object and we have no legitimate overriding interest, or once the purpose for which we hold the data has come to an end (such as the end of a warranty). Review by a staff member of any decision made based solely on automatic processing of your data (i.e. where no human has yet reviewed the outcome and criteria for the decision). You have the right to request a copy of any information about you that Songs of Ink and Steel holds at any time, and also to have that information corrected if it is inaccurate. To ask for your information, please contact our Customer Service Team. If we choose not to action your request, we will explain to you the reasons for our refusal. Whenever you have given us your consent to use your personal data, you have the right to change your mind at any time and withdraw that consent, by doing so Songs of Ink and Steel will be unable to continue trading with you. To protect the confidentiality of your information, we will ask you to verify your identity before proceeding with any request you make under this Privacy Notice. If you have authorised a third party to submit a request on your behalf, we will ask them to prove they have your permission to act. Click the ‘unsubscribe’ link in any email communication that we send you. We will then stop any further emails. How will my jewellery arrive? Your jewellery will arrive with a white label confirming its details inside a sturdy matchbox style box with an invoice or a gift invoice (depending which you chose when you checked out). This is then shipped in a cardboard box to prevent damage. Tarnish during transit is unlikely, due to careful packaging, but possible as I can not guarantee the environment through which the parcel will travel. If your item arrives damaged for any other reason, please contact me to discuss the best resolution. We recommend always getting sized by a jeweller for the larger width rings (10mm+) as these need to be measured slightly differently than a standard ring. We are happy to exchange any ring that doesn't fit you quite right - even if you have opted for a personalised disc, but we won't be able to offer a refund on personalised items or sets. My order has arrived damaged - what do I do? If there is any transit damage to the goods, shortages or incorrect goods, it is your responsibility to let me know within 3 days of receipt. (All goods are sent using a tracked service, so if someone is signing for the goods on your behalf, please remember that this policy will still apply). Any faulty/damaged items must be reported including photographic evidence and either a full refund or an exchange will be provided upon return. I do not accept any responsibility for items not received by me so please use a tracked service. 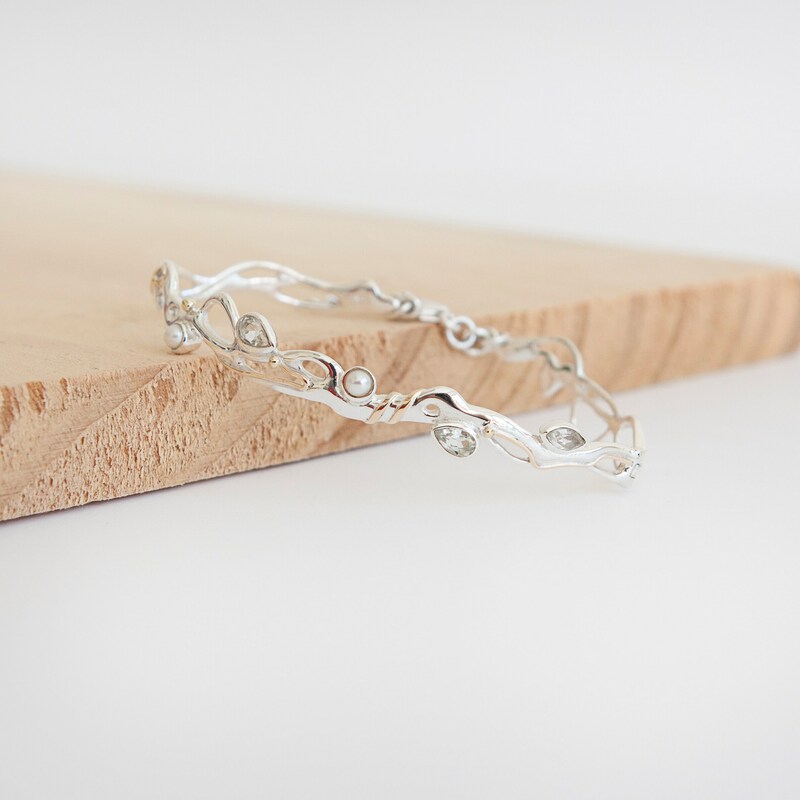 Most pieces of our jewellery include a sterling silver disc including up to 40 characters of engraving over two sides worth £56 that matches the finish. We think that this is a fantastic way to add a personal touch to very beautiful jewellery! Best of all, it is possible to personalise this further by adding one of our fabulous symbols, or even adding a single birthstone to stand alongside your engraving. Spaces ARE classed as characters due to space reasons. 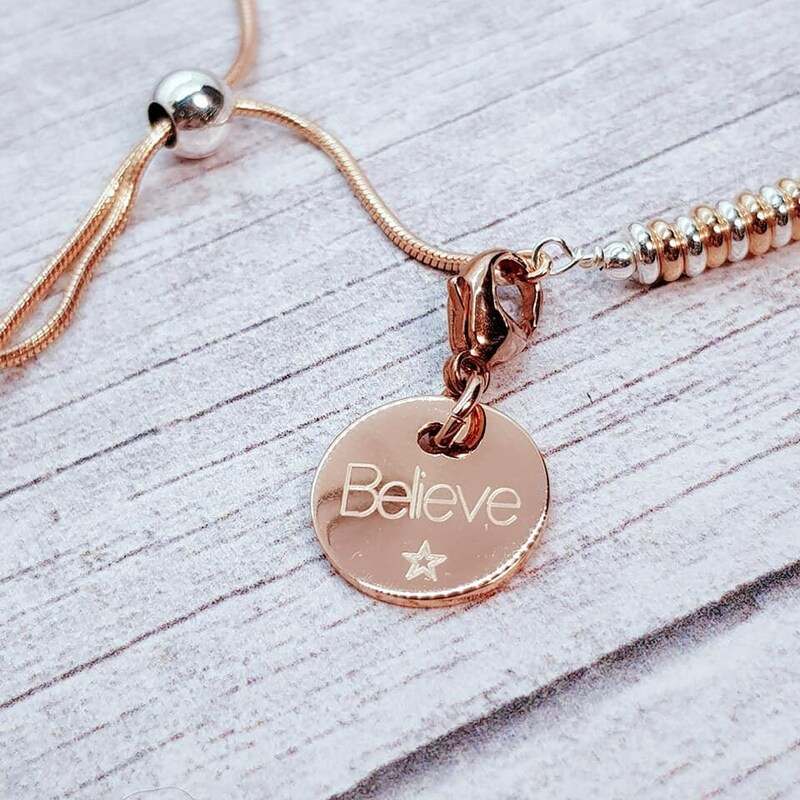 PLEASE NOTE: If you purchase ANY item that includes engraving (INCLUDING rings and pendants) this is classed as a personalised set and cannot be refunded. We will be happy to accept an exchange on these pieces however if not suitable. We engrave our pieces to create bespoke items especially for you. Although we are always happy to try and help if something is unsuitable, we regret we are unable to offer refunds on personalised items or sets. For us to accept a return or an exchange on a non-personalised item, the white label attached to your item needs to be unbroken so please do not remove this unless you are completely happy and want it to live with you forever! Just send us a message and we will give you your returns code. Your item needs to be in the post back to us within 14 days of you signing for this package. If you send your item back after 14 days of receipt, we will not be able to accept it and it will be returned to the address it was sent to originally. Can I send a gift directly to my gift recipient? We include invoices with all purchases. This invoice does include full price details. If you are sending a gift directly to your recipient and you do not wish for them to see prices, you can mark your purchase as a gift. This will then generate a gift invoice with message that we can include in with your package for no extra cost. We are happy to gift wrap your gift for you too - just choose this option at the checkout. I have paid for upgraded shipping, when will my item arrive? As all items are made by hand, we need time to make your items. The time we need varies, and you can find this information on their individual listings. If you pay for upgraded postage, this does not change the time it takes us to make your item as we work on all orders in the order that they have been received. So, for example, two people buy the same item on the same day. The item takes 5 business days to make. Person 1 chooses standard second class postage. Person 2 chooses next day delivery. Their items will be taken to the post office on the same day (as the items take the same amount of time to make) but person 1's item is posted second class, while person 2 gets theirs posted next day delivery. My jewellery has developed a fault - what can I do? In the unlikely and unfortunate case your item should be faulty, you are entitled to a refund or repair within 6 months of receiving the item, but only if the fault was due to a flaw within the way the piece was initially made and not if it is damaged from misuse or wear and tear. Fair wear and tear is not a fault and you have no right to return, refund or exchange if a problem arises because of failure to follow any care instructions you were given on purchase as this will fall under misuse. Please do not assume that because other items of jewellery that you may own tolerate a level of wear and tear that all items can be treated the same. Do you Hallmark your items with the Assay Office? We conform to all UK regulations in respect to Hallmarking with the Assay office. This means that we hallmark all of our items. The only exceptions are items which fall beneath the specified weight thresholds which are 1 gram for gold, 7.78 grams for silver, 0.5 grams for platinum and 1 gram for palladium. We are happy to hallmark any items below this weight, but there will be an extra charge of £20 for doing so as this will not have been factored into our pricing for that item as it isn't required as standard. What postage options do you offer? UK Postage: 2nd Class Signed for postage is included with all purchases which takes between 1-5 business days for delivery. If you need your items a little bit sooner, you can upgrade your postage to 1st Class Signed for which takes between 1-3 business days or Special Delivery which guarantees delivery by 1pm on the next working day. International Postage: Tracked Priority Postage is our standard international postage option. This takes between 1-6 weeks for delivery depending on customs clearance. If you need your items sooner, you can upgrade to a 3-5 business day courier at the checkout. We work on orders in the order that they are made so our turnaround timescale is between 1-7 business days.